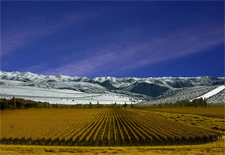 Most of Argentina’s vineyards are situated on the western edge of the Andes along the border with Chile. With no direct access to the Pacific Ocean’s cooling influences, Argentina’s vineyards are defined by their altitude with many of the best sites located 1000 metres or above. As such, this hot, dry and sunny climate is perfect for growing one of the country’s signature grape varieties – Malbec. Originally from Bordeaux, it is often blended with Cabernet Sauvignon and Merlot to produce some of the country’s finest wines. The other variety Argentina is famous for is Torrontés, producing intensely fruity and floral wines with good acidity and body with many of the best examples from the region of Cafayate located in the north. Though a large proportion of Argentinean wine is produced for mass consumption, each of the country’s wine regions has a star producer, and you can be sure to find them here.